As you might know, I have a huge passion for using PECS with my students right now. So many of them have made it so far and are communicating with a variety of people and about a variety of items. We are now moving on to requesting using attributes. Two of the easiest ones that I like to start with are color and size. Color is a great place to start when requesting using attributes. Almost every great reinforcer has a color, and if it doesn't, you can put it into something that is colored! I had some chocolate for one of my little people the other day. Most chocolate is brown, so I didn't really want her to request using "brown". I wanted her to differentiate colors. I had some left over plastic Easter eggs, and figured that I could put the chocolate in the different colored eggs and have her request for the eggs by color. I thought that she wouldn't really want the purple egg if the chocolate was in the green egg. Wow, was I right! My little friend was VERY accurate with requesting the right color during this activity. 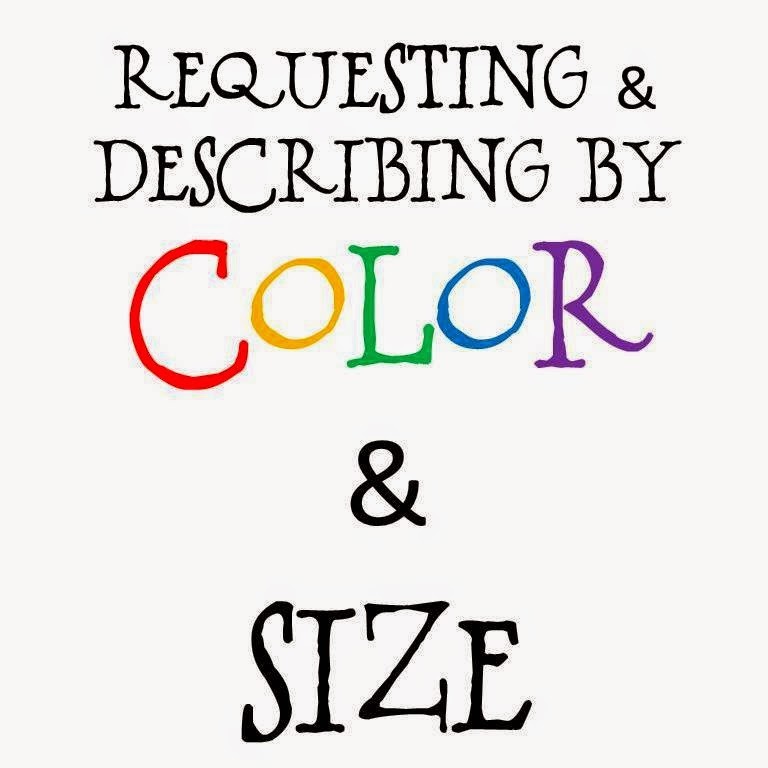 I found a great game to use when I want my students to request using color and size. Bingo Bears! There are three different sizes of bears, and six different colors. You can also really customize your student's boards so that they have to request exactly what you want them to. I limited the size to big and small, and also limited the number of colors. Here is one of my little guys playing with me using his own PECS book to make his requests! I also wanted to make a paper activity that I could use with my students and possibly send home for practice in describing too. I made Requesting Big and Little Fish by Color. I found this really cute clipart from Kari Bolt, and could not resist these little fish! I thought they would be perfect for this activity! This is also the first activity that I am using Smarty Symbols! I recently received a license to use Smarty Symbols in my TpT products, and can't wait to start using more of these. There are so many pictures available! Anyway, back to the activity. These are simple pages that have sentence strips at the top. Students can place their color and size icons onto the sentence strip and then request using verbalizations. If you have non-verbal students who are exclusively using their PECS books, you can simply cut out the icons and place them in/on their book. I have really enjoyed using this activity with my students who have ASD. I love that they can take something home with them to use at home too! To purchase this activity, you can go HERE.